Ancestral spirits are one of the most important aspects to Santeria both in daily practice and in every ritual we perform. 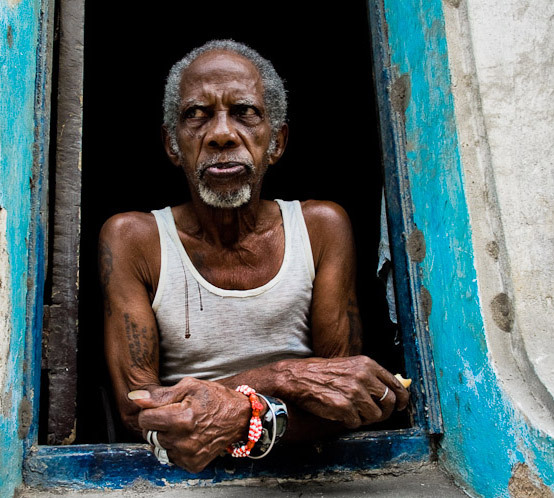 In the religion of Santeria (Lucumi/Lukumi) every newcomer begins their journey by learning to build a relationship with their ancestral spirits. We say that “if we stand tall it is because we stand on the shoulders of our ancestors and are reaching for the Orishas“. To the Lucumi people and to their ancestors the Yoruba, the spirits of the dead were friendly allies. They didn’t fear the spirits of the dead, they petitioned them for help and honored them with libations and offerings. Back in Yoruba land, families would bury their deceased loved ones in the floors of their homes. Their beloved ancestors were literally under their feet and still lived close to the family. The dead are considered spiritually close to humanity and have a vested interest in our success. The Lucumi (Lukumi) people have a very strong element of ancestral worship in their standard religious practice, but there was a marked lack of the worship of non-ancestral guide spirits. As the Lucumi people interacted with the Congo people who do have a strong non-ancestral spiritual tradition, and with Spiritualism (Espiritismo Cruzado), they began to incorporate more Spiritualist practices into the religion of Santeria to make room for non-ancestral spirits. Ancestors of blood relation or of religious lineage are collectively called Egun. 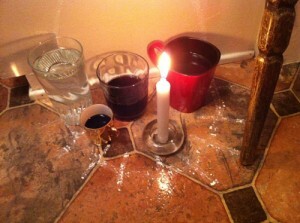 Egun are critical to our religious functions in Santeria. They are always propitiated first (even before the Orisha Eleggua) because we say the dead give birth to the orishas (The dead give way to the orishas). As part of our veneration of Egun, we call upon the names of our religious ancestors and our blood ancestors every time we recite our moyuba (mojuba) prayer. We also make offerings of food, favorite drinks and songs to our Egun before any religious ceremony, and before the ceremony can proceed, Egun must give us permission through Obi divination. 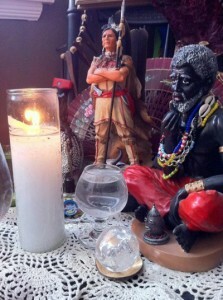 The Egun shrine in Santeria is not an altar with saint statues or glasses of water on it. It is drawn on the floor, typically against a wall, with cascarilla (powdered egg shell). A circle is drawn with half of it on the wall and the lower half on the ground. This symbolizes the sun setting in this world and rising in the world of the spirits. This marks an area where Egun can be propitiated, contacted and receive sacrifices. Typically nine different drinks are placed in that circle. Any drinks that your Egun would have enjoyed are appropriate but commonly people offer coffee, rum, water, tea, juice, or even coca-cola. In addition to these items, a white candle is often lit and placed in the circle to offer light and energy to Egun. Finally, a special staff or cane is placed at the shine called the opá ikú (staff of death). The oká ikú is decorated with strips of cloth or ribbons in nine different colors (nine is a number often associated with the dead), and often jingle bells are attached to the staff in some way. The opá iku is used when praying the moyuba (mojuba) to the ancestors, by tapping it on the ground to call up Egun to be present. In the Yoruba homeland, the tapping of this staff was literally done on top of the graves of the buried ancestors in the home to call them up and bear witness. Egun are also venerated with special drum ceremonies where they can take possession of those present and dance and revel with the participants, or with other sacrifices or offerings at the Egun shrine. A strong relationship with Egun is important to spiritual evolution and in order for your path in life to be clear and easy. All Egun are araorún (citizens of heaven) but not all araorún are Egun (blood or religious ancestors). As the Lucumi people in Cuba began to follow the practices of Spiritualism (Espiritismo Cruzado) they began to work more and more with spirit guides. These spirits are friendly spirits or guardian spirits that are not of blood ancestry, nor of religious lineage. These are known as araorún (or ara onú) meaning “citizens of heaven”. These can include indian spirit guides, pirate spirits, gypsy spirits, madama spirits, or spirit guardians of other traditions not associated with the person they protect. These classes of spirits are commonly addressed through Spiritual Masses (Misas Espirituales) using Spiritualist practices of mediumship, prayer and transmission of psychic information. Spiritual Masses are a result of a combination of traditonal Kardecian Spiritism (the spiritualist techniques taught by Allan Kardec in the 1800’s) blended with many of the Congolese spiritual traditions of using herbs for spiritual cleansings, using smoke of cigars or spirt possession. Spiritual masses allow the faithful to connect with their guardian spirits, send healing energy to dark or troubled spirits that may need help in crossing into heaven, or to give and receive spiritual cleansings to assist in spiritual development. The development of mediumship skills are the primary focus of spiritual masses and they are often led by an experienced medium who can guide and teach others. They are heavily syncretized and the recitation of Catholic prayers is typically the mode used to enter into meditation and trance. The center of worship for araorún in Santeria is the Spiritualist Altar called a bóveda (BO-veh-dah). The bóveda is typically a table or altar covered with a white cloth upon which are placed 7 (or 9) goblets with clear water in them. Typically one of the glasses is larger than the rest. Commonly a crucifix is placed on the altar along with offerings of flowers, photos of the deceased (only) and occasionally offerings of cigars or drinks that spirit guides may ask for. It is common for statues of indians, congo men, mammy-styled women, gypsies and other dolls to be placed on the altar as representatives or vessels for guardian spirits. Worship at the bóveda is a strictly Spiritualist (Espiritismo Cruzado) ritual function and in the strictest sense is not Lucumí (Lukumi) religion, but it has become an inseparable part of most religious function in Santeria.